Above: Arrival at Vienna Airport and suddenly there was the cold Austrian winter. Warm socks and shoes were welcome gifts upon arrival. Of the five European countries which took in the Uganda Asians on a transit basis, Austria accepted the largest number - some 1,500 persons. Soon after their arrival in November and December, selection missions from the Netherlands and Sweden started choosing likely candidates for resettlement; under their respective quotas, Sweden accepted 319 persons and the Netherlands 253. Following the decision by the British authorities to admit heads of families whose British passport holding dependents were resident in the United Kingdom, another 160 persons left Austria. Counting those who had emigrated to other countries, 756 persons remained in Austria on 31 March 1973, still awaiting resettlement opportunities. The majority had expressed their desire to go to an English-speaking country: the United Kingdom, Canada, the United States, and also Australia and New Zealand. At mid-April, there were more than 420 applicants for Canada. The Asians' hope, even slight, of being able to join relatives or friends in one of these countries explains the relative reluctance on their part to accept Austria's offer of permanent resettlement places. In fact, only some 70 persons had chosen this solution to their problems. In the meantime, the balance are still living in the transit centres - half at the Traiskirchen refugee reception centre near Vienna and in two rest-homes in lower Austria (Neuhaus and Reichenau an der Rax); and the other half in hotels at Wallsee (Lower Austria), Saxen and St. Nicholas (Upper Austria) and in a home for the handicapped at Thalem, near Salzburg. This dispersion, due to the lack of suitable accommodation in and around the Austrian capital, has at times caused difficulties, particularly in informing and counselling the Asians. 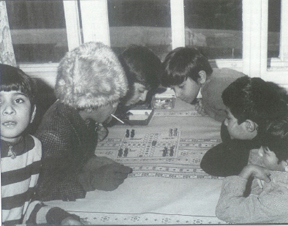 Above: In the corner of one of the rooms of Austria's Traiskirchen transit centre, four youngsters enjoy a typical European game of Ludo ("Manesh agere dich nicht"), designed to teach acceptance of bad luck. The task of caring for the Asians was split up among voluntary agencies along geographical lines: the World Council of Churches for those living in Lower Austria, and Caritas, in cooperation with the International Catholic Migration Commission, for the others. As soon as the Asians arrived these agencies made themselves responsible for their welfare, distributing warm clothing, taking care of individual cases, especially those who wished to find jobs or settle permanently in Austria. Later, they helped to check and support the Asians' applications for admission to other countries, through consulates or selection missions. This constituted a follow-up to the work of a UNHCR official who spent two months in Austria keeping a constant watch on the day-to­day developments of the impatiently awaited resettlement offers. The Austrian Government, for its part, is doing its utmost to find solutions to the problems facing those Asians wishing to settle in the coun­try. The most acute is housing; job opportunities ire most easily available in and around Vienna, but unfortunately this is the area where accommodation is the most difficult to find. As will be seen from the following case-history, a family with three members having found jobs is still living at Traiskirchen; here, the authorities are in the process of arranging comfortable accommodation in an apartment block for families who wish to settle in Austria. "Figyelem, figyelem, Kovacs Karoly jojjon a Lagerleitung-ba!" (Attention, Attention: calling Kovacs Karoly, come to the office, please). Nothing strange about an announcement in Hungarian over the loudspeaker system at the Traiskirchen refugee reception centre - except that the voice was that of an Asian girl from Uganda, Shamira A. 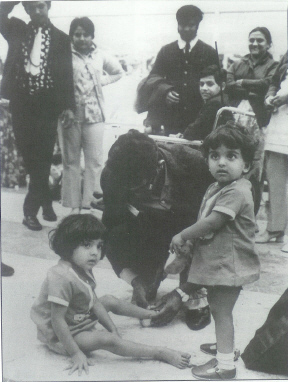 She arrived at Traiskirchen in November 1972 with her father, mother, brother and two small sisters. A few days later, the family members capable of earning their living started looking for jobs. Shamira was immediately hired by the administration of the centre, where she serves as interpreter, fills out forms and does all sorts of useful odd jobs. Rajabali, the father, who had been a bicycle merchant and mechanic, looked for a job in his own field, but had difficulty finding one because of the language problem. He and his son Shafik finally were able to find employment in a nearby metallurgical plant. The younger girls, Nouvaz 11, and Nailin, 13, are going to school in the neighbourhood and have quickly picked up German - and with the Lower Austrian accent! They are often invited by their schoolmates, and life for them is almost back to normal. Not so for all the members of the family, however , as they still live six to a small room in the Traiskirchen centre. The housing problem in this area is not easy to solve, even for an Austrian. Landlords insist on high down-payments for most rented accommodation, and neither the Government nor the voluntary agencies have yet been able to establish a fund to cover such expenses. It is hoped to find an apartment for Rajabali and his family in a municipal housing complex now under construction. When it is ready, Shamira hopes to resume her studies, as does her brother Shafik, who should have finished his secondary education this year. In the meantime, these are busy days for the whole family. They are up at 5 a.m., so that Rajabali and Shafik can catch the bus which takes them to their jobs at the Thormetall plant. At 8 a.m. it is the children's turn to leave for school. Shamira, in her spare time, is studying German with a tape recorder. Each Saturday, she accompanies her father and brother to the home of a secretary in the plant, who gives them German lessons. The mother, Shirinkhanu, has some time to dream, when she has finished the housework - but even in her dreams she is mainly concerned with finding ways of improving their lot. Why shouldn't she use her cooking talents, once she has her own kitchen, to offer some new exotic taste thrills to the many gastronomes of cosmopolitan Vienna? They are always on the lookout for new restaurants, and her dishes are even spicier than the Viennese! One can dream, and thanks to the sympathetic welcome given to the Asians, among them the M. family, some of these dreams may well come true.